The machine is designed for separating feathers and offal from waste water. Due to the application and method of transporting elements inside the screen, two separate devices must be used for separating offal and feathers. 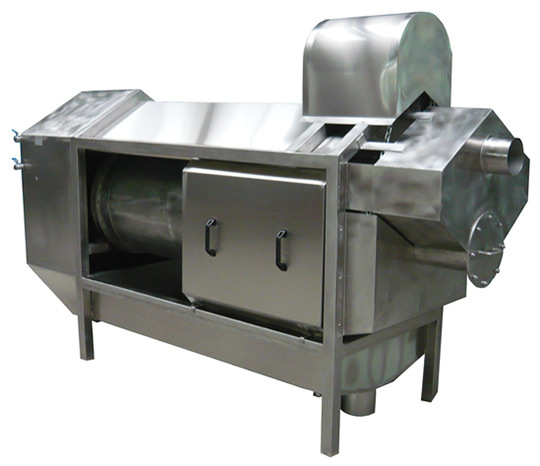 The separator is made of stainless, acid-resistant steel. The basic unit of the separator is the trough-shaped body, containing a horizontal cylindrical screen, mounted on rollers. In the lower part of the body, there is a waste water trough. The drive is installed on the upper part – when activated, it rotates the cylindrical screen. Offal or feathers are fed into the screen, where they are separated from water and conveyed towards the outlet. Above the screen, a washer is fitted. The separator length depends on its capacity.